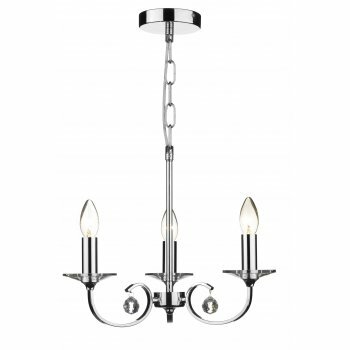 Dar Lighting Allegra 3 light multi-arm ceiling fitting features a circular design ceiling plate with central rod and chandelier style metal frame, all in polished chrome finish with crystal droppers and glass sconces. The product code for this Dar ceiling fitting is ALL0350. The Allegra range includes a 9 or 5 light multi-arm ceiling fitting and a 2 light wall fitting which can be viewed on our website.